From seitan sausages, soya steaks, and tofu burgers, to a variety of crunchy vegetables, vegans and vegetarians are not short of things to put on the barbecue. 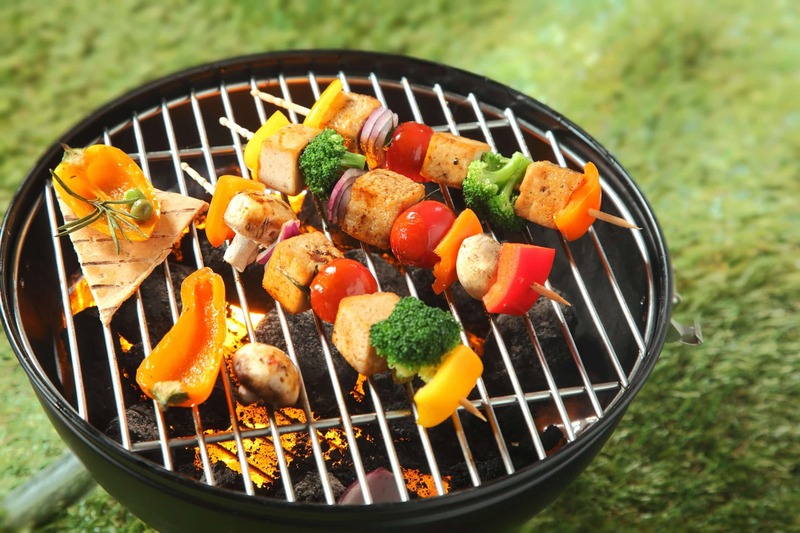 ProVeg has compiled some helpful tips for a meat-free barbecue, as well as a selection of vegan/vegetarian foods suitable for grilling. Vegetables and fruits that have a low liquid content are good choices for a vegan/vegetarian BBQ. Foods that contain too much moisture lose a lot of liquid when grilled, causing them to quickly overcook and become too soft. Be careful with adding too much salt since it promotes moisture loss and should therefore only be used sparingly after grilling. Zucchinis, bell peppers, mushrooms, artichokes, sweet potatoes, pumpkins, corn cobs, potatoes, and carrots are all ideal for grilling. Belgian endives and radicchio are also good choices, although bear in mind that they have a very short grill time. Fruits such as apples, bananas, mangoes, pineapples, peaches, figs, and pears can also be grilled briefly and make for delicious desserts. To ensure that as few nutrients as possible are lost on the barbecue, vegetables should be roasted at a low temperature and only for a short time. Before putting them on the grill, brush vegetables with oil, herb margarine, or marinade. For BBQ marinades, use refined oils such as sunflower or rapeseed oil as they tolerate higher temperatures (about 200 °C). Season vegetables with garlic and fresh herbs such as rosemary, thyme, and marjoram to give them a Mediterranean flavour, and only salt them afterwards. Pepper and a dash of lemon can round off the taste. Potatoes should be wrapped in foil before putting them on the grill. In the last few years, the range of vegan meat substitutes that are suitable for grilling has grown considerably. Today, almost all supermarkets offer a wide selection of vegetarian and vegan products that are similar to meat in both taste and texture. Ready-made meat and fish substitutes based on soy, seitan, tempeh, or cereals can be placed directly on the grill unless otherwise recommended. Tofu is an increasingly popular plant-based alternative. It is made from curdled soy milk and, due to its rather neutral taste, is ideal for marinating and seasoning. Whether sliced, diced or skewered, or used as a filling, tofu is a versatile ingredient for any barbecue, and varies in taste, depending on the marinade used. Those who do not wish to marinate tofu themselves should make sure to buy smoked or marinated tofu since plain tofu can be quite bland. When barbecuing tofu, choose a firm variant (not silken tofu), as firm tofu maintains its consistency when heated. If tofu is grilled in slices or diced and skewered, it should be marinated beforehand. However, first squeeze the excess liquid from the tofu so that it absorbs the marinade. Brush the grill with oil before grilling so that the food does not stick. After grilling, season with salt, pepper, and a dash of lemon. Due to its meat-like texture, seitan is particularly suitable for a traditional barbecue. Since it is made mainly from wheat protein, it has a very high protein content but, unlike meat, contains no cholesterol and very little fat. Seitan is often a key ingredient in plant-based steaks, burgers, and sausages, all of which are great for grilling and roasting. Making seitan at home is a simple process and allows for customised seasoning.